Today is an unfathomably sad day, as the horrific reality of Stephen Paddock’s shooting spree from the 32nd floor of the Mandalay Bay down on to thousands of unsuspecting festival goers in Las Vegas begins to sink in. A total number of 58 people were killed in the gunfire, along with more than 500 people injured from his automatic machine gun fire from two broken windows, which he somehow managed to smash without anybody noticing or sounding the alarm off beforehand. Stephen Paddock, 64, killed himself before the police arrived to his room. The smoke alarm went off from all the gunfire which gave away his location to the police. Before tactical police could enter the room by using explosives to neutralise him, Stephen shot himself in the head to take his own life. Regardless of the outcome, after his continuous 72 minute barrage of shooting at innocent targets down below, the damage was already done. The news media and investigators are saying that they do not know the motive of Stephen Paddock’s machine gun assault, saying that it’s a mystery. His family and friends have also stated that they were shocked beyond words and that they cannot believe he would ever do something like this. He had 23 guns in 10 suitcases in his suite at the Mandalay Bay hotel, some of which were set up on tripods, set to automatic gunfire, so his actions were more than premeditated. The real question remains: Why did he do it? 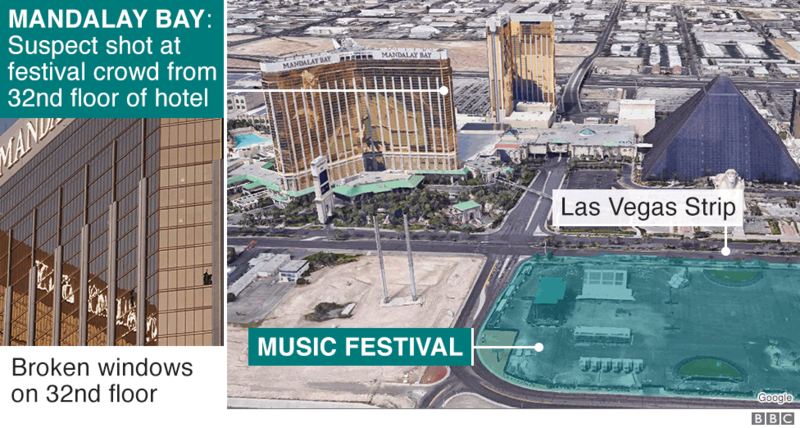 Stephen Paddock was a multi-millionaire realtor who enjoyed gambling in Las Vegas, on slots and tables, spending big amounts of money, but this has nothing to do with his motivation in shooting the people at the festival. Islamic State went on record to claim the attack was part of their plan, and that Stephen Paddock had converted to Islam before this attack took place, but no such evidence has been given or found to make this claim true. We cannot be sure of what his motives behind this truly was, and the news reports say that he had no political, or religious affiliations whatsoever, as far as his friends and family are concerned. Why would Stephen Paddock do this? Was he instructed to? Did he do it off his own accord? What made him shoot at festival goers at a country music festival? When we first heard the news breaking yesterday, we knew that this would be the most horrendous mass shooting in modern American history, given his aerial leverage and from the sounds of those shots, which even echoed over the live music. We knew the true severity of hearing the full automatic gunfire ringing out, and we are only surprised that there were not even more casualties given how well armed and prepared for the assault he was. Today, we find it hard to cover any other news as all we can think of are all the deceased victims, their families, their friends, and everyone else who was unfortunate enough to get caught up in the nightmare of that night in Las Vegas. Not to mention all of the injured victims (over 527 people) that are currently fighting for survival in hospital, many with whom have life changing injuries. It is entirely possible that the death toll could rise even further as the days go on. 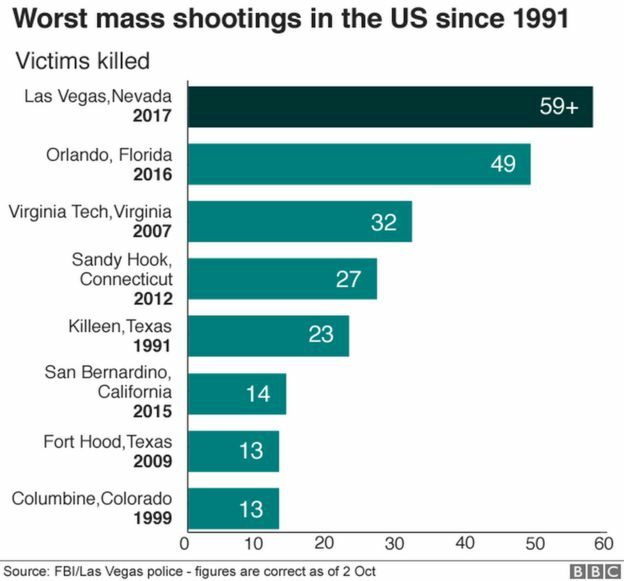 This massacre has once again brought up the debate on gun control, but with the 2nd amendment so engrained in America’s culture and history, banning it now would still leave an unimaginable amount of weapons still out across the whole country, posing a security risk for those that do and don’t have them, with the people who do having their rights to protect themselves stripped from them by force. That would also enable criminals to kill further people without meeting any opposition. It’s a real catch 22 situation with no easy means to solve it. Stories of heroes helping the injured, and those dying in this nightmare are aplenty, with many people coming out in droves to donate blood following the massacre. We feel it would disrespectful and un-newsworthy to cover, or even touch upon any other news stories on a day like today. The very thought about those that have been directly affected in this traumatic murder fest, all because of one crazy man’s actions, which has ruined the lives of so many people… It’s truly horrifying, and it makes us feel sick to our stomach’s. Our prayers and healing energy go out to all the victims, and to those that are still fighting for their very lives in the emergency rooms all around Las Vegas. Anybody with any sense of empathy will be deeply shocked and stunned by this news, and that’s why we won’t be bringing you anymore news today. We will be doing our bit to try and help too. If you follow our Instagram page, we will be providing some light hearted humor there to help make you feel better, if you can even attempt to chuckle on a day like today. Doing something to focus on anything else but this horrendous incident might help people take their minds off of it.